PIknic Electronik sculpture. Photo Mert Kimyaci. As the heat of the sun beats down on our backs and the sounds of electronic tunes and DJ sets feed our afternoon craving for chilled entertainment, we soak up all that surrounds us. Hot weather, sweet sounds, cool drinks. It’s a Sunday afternoon in Montreal and I decide it is about time I venture to one of the main music events held every Sunday afternoon throughout summer: Piknic Electronik. Piknic Electronik. Photo Annie Shreeve. Lets just say, Piknic Electronik is a sweet way to spend a hot summer’s afternoon. With electronic music at the heart of the festival’s existence, Piknic also aims to promote diversity and new discoveries. Featuring both local and international artists, there is always a little piece of electro for everyone. And, since 2012, Piknic has featured its cool vibes in Barcelona also! So as you can imagine, for some time now I have been wanting to visit Parc Jean Drapeau to experience this well known event first hand. Piknic Electronik is an outdoor music festival featuring DJ sets beginning at 2pm and continue to play into the evening. The event usually features five artists thought out the day. DJ Begun (right) joins DJ Pfreud (middle and DJ GD (left). Photo Mert Kimyaci. As the afternoon begins to evolve into the night, the party picks up its pace. The first couple of hours are more “chilled out” and family friendly. A slower and more relaxed vibe to start as people mill and enjoy an iced cold beverage or two. Later, it becomes a beating dance party. Children are welcome anytime, but must be accompanied by an adult. No alcohol can be brought into the Piknic however bars with both alcoholic and non-alcoholic drinks are available. 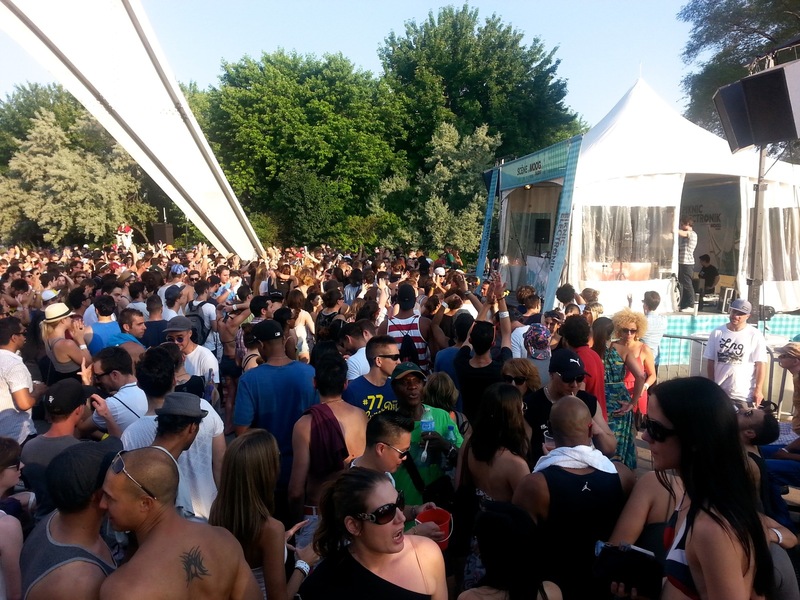 My afternoon at Piknic Electronik was a great one, and something I would recommend for locals and tourists alike. Five minutes from downtown Montreal, Jean Drapeau offers a welcoming relief from the city streets, a breathtaking view of the city’s skyline and a chance to let your hair down and have a little dance amongst the nature of the park and sweet electronic sounds. 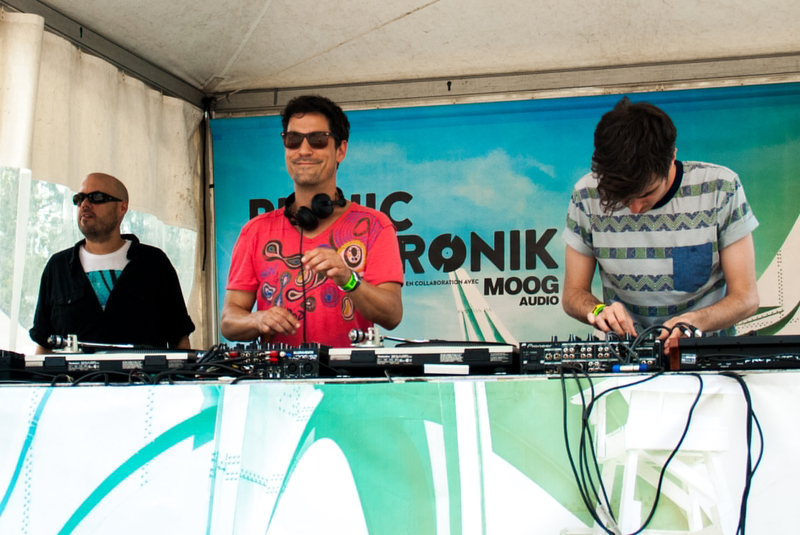 Piknic Electronik is held at Parc Jean Drapeau every Sunday until September 21st, from 2pm onwards. Tickets are $10 if you arrive between 2-3pm and $15 from 3pm onwards. The parc can be accessed via bike, car, metro or bus.